Keola Ryan was born and raised in the ahupuaʻa of Waikīkī on the island of Oʻahu. Thanks to his family he grew up with a deep appreciation for Hawaiian culture, natural environment, and the University of Hawaiʻi at Mānoa (UHM). Partially raised by his grandfather, civil engineering professor Dr. Paul Hummel, Keola grew up on the Mānoa campus and has always considered it a second home. After graduating from Kamehameha Schools, Keola attended UHM and entered the Hawaiian Studies program. 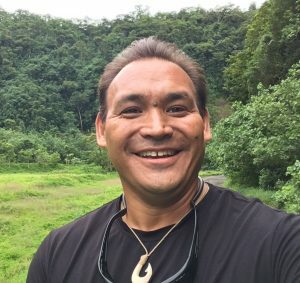 He has since earned a Bachelor’s of Arts in Spanish Language and Hawaiian Studies as well as a Master’s Degree in Hawaiian Studies specializing in mālama ʻāina and kumu kahiki. His thesis entitled Rapa Nui-Hawaiʻi Connections: A Translation of Geo-Etimoligia de la Isla de Pascua analyzes Rapa Nui place names in comparison to those of Hawaiʻi and the greater Pacific. Outside of academia Keola has studied the art of hula for several decades under William Kahakuleilehuahaunuʻu “Sonny” Ching. In 2011, he successfully completed the ʻūniki rights before a panel of loea hula and graduated to the rank of Kumu Hula. He has since written a hula class (HWST 327: Mele Hula o Pelehonuamea) and teaches it at Kamakakūokalani. In addition to his work at the university, Keola and his wife run a conservation based eco-tour company in Waialua, Oʻahu. This venture brings his interests in Hawaiian culture, natural environment, and education together in a way that positively impacts the local community.